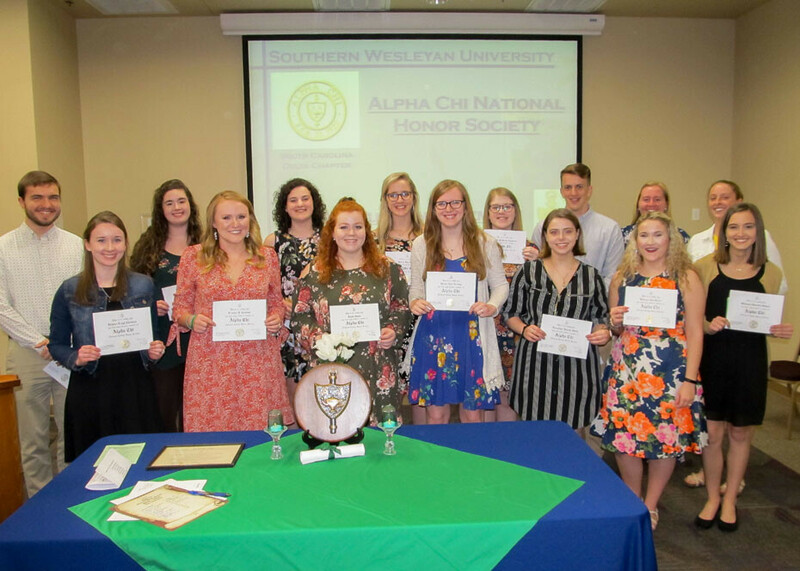 The Southern Wesleyan University Chapter of Alpha Chi honor society inducted 15 students during a ceremony April 9 on the Central campus: Front Row, L-R: Brynna Leigh Chestnut, Frankie V. Costner, Kayla Nicole Parks, Alexis Noel Darling, Josephine Dakota Smith, Rebecca Ann Reese, Madison Danielle Stancil, Back Row, L-R: Matthew Morgan, Riley Anne Nicholson, Katelyn Dailey, Monica Joy Keever, Ashton McKensy Langston, Alexander Kurtz, Megan Pickering, and Jessica Fayth Sparks. Established Feb. 22, 1922, Alpha Chi was founded as an honor society to promote academic excellence and exemplary character among college students. Its membership is limited to the top 10 percent of the Senior Class and the top five percent of the Junior Class. Alpha Chi has chapters in 45 states, Washington, D.C. and Puerto Rico, and more than 490,000 members have been inducted since its founding. Approximately 11,000 members are inducted annually.